Mach Rider takes place in the year 2112, and planet Earth has been invaded by evil forces. 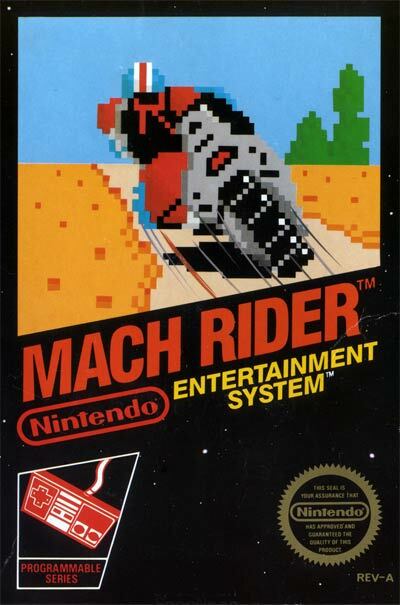 The player controls Mach Rider, who travels from sector on a motorcycle to sector destroying the enemies in the player's path. In Fighting mode, the player travels across 10 sectors, and tries to avoid being destroyed by obstacles and enemies. In Endurance mode, the player must race a certain number of miles within a time limit while enemies and obstacles get in the way and slow down the progress. Solo mode is the same as Endurance mode, except that there are no enemies. The last mode of gameplay is Design mode, where the player may design their own sector. The game's controls are somewhat more complex than other games at its time. The left and right buttons steer Mach Rider and the A button accelerates. The B button fires Mach Rider's machine gun which can be used to destroy enemies and obstacles on the road. The up and down buttons are used to change gears.